Do you currently live within a reasonable and realistic commuting distance from Dallas, TX? Maintenance and repair of mission critical facilities equipment and building systems including but not limited to mechanical, electrical, HVAC, emergency generators, fire/life safety systems and associated equipment. Expand your skills in mission-critical systems and showcase your potential to advance. You will work in a diverse role where you will contribute to the operation and monitoring of state-of-the-art data centers, including day-to-day operations, project management and coordination, construction / installation management, and more. You’ll expand your skills and experience working with both the engineering and IT sides of the business, as well as on a variety of systems and state-of-the-art equipment that will keep you on the cutting edge. You’ll enjoy training & learning opportunities, both formal and informal. You will have the opportunity to own your projects, working them through to completion. We are proactive about helping our people grow and develop. In fact, we have two Data Center Facilities Engineer II roles open; both due to promotion! You can build a lasting and rewarding career with a high-profile global leader. All this will set you up to build a rewarding career with a high-profile, global industry leader. You know that critical infrastructure is the wave of the future in facilities management, and as Digital Realty continues to grow, we'll be looking for proven performers to move up. Hands-on electrical or mechanical skill and competence in the area of non-expertise (for example, electrical expertise with mechanical competence, or vice-versa). Strong interpersonal, presentation and communication skills with the ability to respond effectively both verbally and in writing to sensitive issues, complex inquiries or complaints. Proficiency in Microsoft Word, Excel and Outlook; familiarity with Microsoft Project, Adobe Acrobat, Visio or AutoCad. Strong quantitative and qualitative reasoning skills, with demonstrated ability to determine event root causes, performance shortfalls and required corrective actions. A team-player approach and high level of commitment to customer service to both co-workers and clients. Lift and handle up to 50 pounds. Bend, stoop and stretch as required for placement and retrieval of network devices, materials, or equipment. Work under a raised data center floor. Climb ladders (up to 16 feet) to reach plenum spaces. You will work the first shift, Monday - Friday from either 7:00 a.m. - 4:00 p.m. or 9:00 a.m. - 6:00 p.m., and there will be occasional overtime. You will also participate in a 24-hour on-call rotation. Depending on which facility you are assigned to, the on-call rotation will be either every other week or every 3rd to 4th week. Reporting to the Manager, Facilities Engineering for your assigned site, you will join a team that includes either four other engineers or one other engineer. While you'll primarily work at your assigned facility, you may help out at other facilities on occasion. Daily, you will perform rounds and respond to issues that arise, as well as overseeing and monitoring all aspects of the facility's operations. You will leverage your experience in mission-critical infrastructure, including generators, UPS Systems, HVAC Systems, Fire/Life Safety Systems, BMS systems, and CMMS systems, along with your mechanical and/or electrical skills. Pivotal to your success will be your ability to troubleshoot and repair equipment and systems independently. Conducting routine, ongoing assessment of the building systems operations. Performing tests and rounds, and analyzing data to assure the proper functioning of equipment. Performing preventive maintenance on all building equipment. Working on building management programs for a mission-critical facilities environment. Ensuring the efficient operation of all building systems. Coordinating maintenance efforts, as needed, with outside contractors, tenant finish personnel and engineers. Maintaining lighting in all areas of the building. Ensuring compliance with all safety procedures as well as the utilization of protective equipment. Maintaining ongoing communication with tenants, owners, property management and vendors. Assisting in updating and/or maintaining as-built drawings. Responding quickly to emergency situations (fire, evacuation, equipment failure etc.) and customer concerns. Assisting with maintaining inventory control programs/purchasing parts and supplies. Ensuring compliance with applicable codes, requisitions, government agencies and company directives as they relate to building operations. Pictured: The Bryan Street location, Dallas. 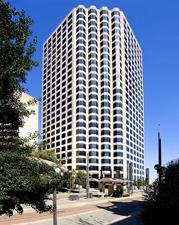 Bryan Street is the premier internet gateway and carrier facility in the Dallas area. Located in the Central Business District (CBD), the building consists of 26 floors and approximately 477,000 SF of datacenter, PBB and office space. 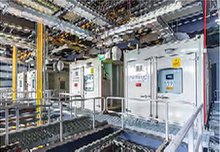 The facility provides connectivity access to over sixty (60) of the leading domestic and international carriers and physical connection points to the world's telecommunications networks and internet backbone. Your primary focus, of course, will be on the critical infrastructure, but you'll share responsibility for the entire site and most likely you'll gain experience in areas that are new to you. In addition, we are committed to helping our people grow professionally, including providing training and promotional opportunities. From this role, the next step up could be a Facilities Engineer III, though, depending on your skills and experience, you could follow other paths. Pictured: Our data centers have leading-edge mission critical systems such as cooling (shown), power, security and more. Each of our data campuses is part of the largest ecosystem of world-class U.S., European, and APAC carriers, hosting physical connection points for the world's telecommunications networks and Internet backbones. Top performers in this role are not defined by the strength in their back, but by the strength between their ears -- they combine knowledge and common sense to know when to push a button and when not to. They also grasp the important role played by the equipment and infrastructure in this data center, and the critical role played by the data center in our customers' businesses. Billions and even trillions of dollars are transacted over the networks we support. Downtime of even a few minutes can cost millions. Digital Realty has achieved key metrics in uptime, in no small part because of the dedication and passion of our Facilities Engineers. To be successful on this team you'll need to see this as much more than a job -- you'll need to see it as a mission. Reliability, communication, and a sense of urgency will be key.